This post is about 650 words. It should also be noted that book and images discussed below were copyrighted by TSR Hobbies in 1982. 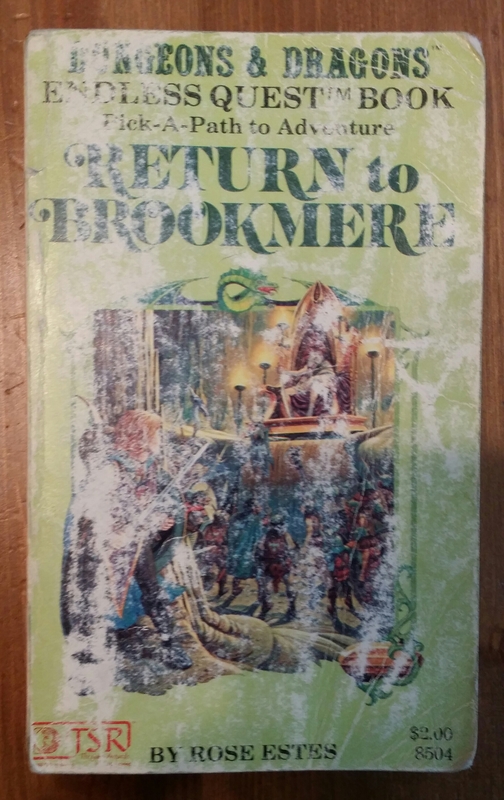 This is a book from my childhood, entitled Return to Brookmere. It’s #4 in the Dungeons & Dragons Endless Quest series. As you’ve probably guessed from the worn cover, it is a beloved, multiple-read, go-everywhere favorite. While not high literature, its influence on me as a reader and writer cannot be overstated. It’s likely to make multiple appearances on this site, btw. As such, I wanted to do it proper homage as a way to say thank you to author Rose Estes, as well as D&D itself. I hadn’t read the book in a few years, though it had a place of honor on my bookshelf. One element that stuck with me for more than three decades is the magical amulet, named the Mouth of Mimulus, or simply Mim. Shaped like a dragon’s head, this animated charm offered advice and commentary on the adventure. I don’t recall much backstory being written, however. In my own story, I was looking to create another advisor for Tildy, someone to serve as a counterpoint to the witch, Tildy’s adoptive mother. I also wanted a way to have Tildy work through some of her own concerns without always relying on inner monologue. I didn’t want to add another companion on their journey, but if the advisor was also a secret, this could lead to future conflict. When I recalled Mimulus, I knew I had the inspiration I needed. Thus, the magnificent amulet Mumnambulen came to life. Mum, for short. In my story, Mum was an ancient spirit inadvertently imprisoned when the amulet was cast. Nearly destroyed an age ago, Mim has been re-cast, which changed its face and personality. Its allegiance is solely to the person possessing it, which means it tries harder to endear itself to more capable owners. Consequently, it usually looks out for its own best interests. It also speaks more witticisms than wisdom and holds a grudge against Tildy for stealing it because Mim deems her an unworthy thief. Tildy will often question its trustworthiness. Now we are finally to the topic promised by the title: working an homage into a story versus simply ripping off someone else’s creation, a vile act of plagiarism. We’ve all been inspired by others. I’ve been influenced by various works of literature, art, music, movies, and video games. But I love – absolutely love – the idea of new ideas. Repackaging someone else’s ideas has no appeal for me, ethical considerations aside. To be honest, being accused of plagiarism is one of my greatest irrational writing fears (I expect this to be an ongoing topic of thought as I continue my book series). And so, I went into my novel fully aware of the dangers of copying someone else’s work, accidentally or intentionally. The name Mum, aside from offering wordplay opportunities, was inspired by Mim, yes. Aside from that, I’m feeling pretty comfortable with the distinctions I’ve made: my magic amulet deliberately has another design, a deeper backstory, and a different personality. It has a more complex relationship with its owner, something that will continually evolve over the course of the book series. Even so, I will be re-reading Return to Brookmere to ensure deviation from the source material, and if I have to, I would change Mum’s name or form to protect the greater body of work. It is my sincere hope that my creation will be viewed as an homage to a beloved childhood tale. And while it’s easy to believe there are other stories that also contain magical talking amulets, those similarities are completely coincidental. Crafting a novel, a world, and a mythology require so much effort, it is a shame to spend even a sliver of that energy on the deliberate theft of someone’s work. As writers, we need to be dilligent to ensure we’re not accidentally doing so when trying to honor a creator we admire. And that is time well spent. © Michael Wallevand, June 2016, except the D&D properties. This entry was posted in Work Ethic, Writing, Writing Inspiration, writing process and tagged fiction, novel, writing process. Bookmark the permalink.